We are glad to announce that EVIta, the Italian Society of Extracellular Vesicles has been founded at the end of last year. EVIta is looking forward to collaborating and to promoting partnerships, which will foster the cross-fertilization with national and international societies. Further information about EVIta can be found at our recently lunched webpage: https://www.evitasociety.org/. EVIta is just about to organize its first annual meeting (https://www.evitasociety.org/1st-evita-symposium-2019) that will take place on 6-8 November 2019 in Palermo, Italy. A symposium focusing on microRNA in animal , vegetal and health biology will take plae on teh 11of April in Villejuif. A workshop session on RNAs and Extracellular Vesicles will take place during this symposium. An EMBO Meeting on Caveolae and nanodomains will take place in Le Pouligen (France). Le réseau Grand Ouest (GO-EV) organise un séminaire sur l'imagerie des vésicules extracellulaires le 8 février 2019 à Oniris, Nantes. 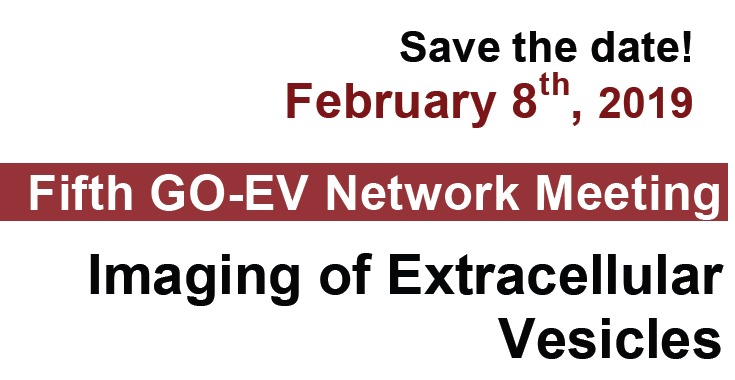 The Reseau Grand Ouest EV (GO-EV) organizes a meeting on Imaging of EV on February 8, 2019 at Oniris, Nantes. Le club Endo-Exo organise son congrès annuel du 3 au 6 Avril 2019 à Mandelieu La Napoule (France). 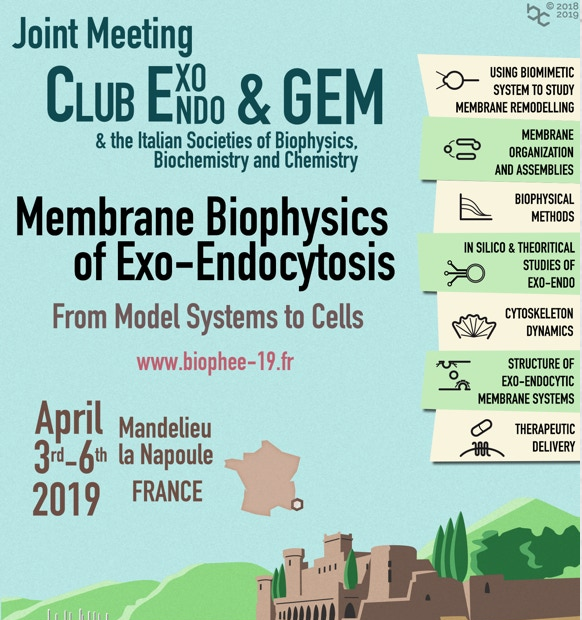 Endo-Exo Club organize his annual meeting in Mandelieu La Napoule (France) on the 3rd to 6th of April 2019. La Société Internationale des Vésicules Extracellulaires (ISEV) organise son congrès annuel du 24 au 28 Avril 2019 à Kyoto, Japon. Les soumissions d'abstracts et Registrations ouvriront bientôt. 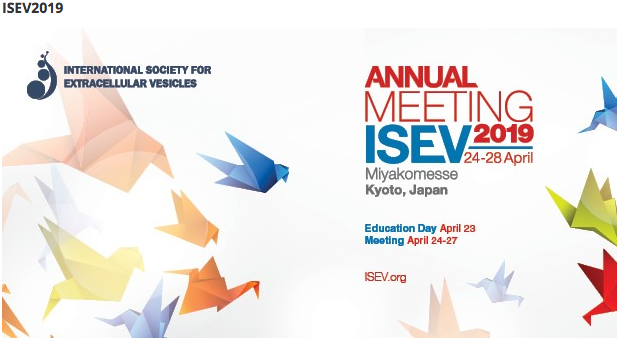 The annual ISEV meeting will take place in Kyoto, Japan on the 24-28th of April 2019. La Société des Neurosciences organise un colloque international du 22 au 24 Mai 2019 à Marseille, France. Un symposium intitulé "Exocytosis and extracellular-vesicle signalling in brain development, maintenance and diseases" sera organisé. The Society of Neurosciences is organizing an international meeting on the 22-24th of May 2019 in Marseille, France. A symposium titled "Exocytosis and extracellular-vesicle signalling in brain development, maintenance and diseases" will be organized. L'EMBL (European Molecular Biology Laboratory) d'Heildeberg, Allemagne organise une session de cours (théorique et pratique) sur les Vésicules Extracellulaires du 2 au 8 juin 2019 a Heildeberg en Allemagne. Les demandes d'inscription ouvriront bientôt. Attention le nombre de places est limité. The European Molecular Biology Laboratory of Heildeberg is organizing a training eventon the Extracellular Vesicles on the 2-8 of June 2019 in Heildeberg , Germany. .